So much DOOM, it hurts! 5 damage of the special attack becomes 10 if the enemy has any weakness to darkness. -- gmill711 for the image. -- Ryuu for "Dark" Non-DA status information. -- Sheffy for updated location and price info. 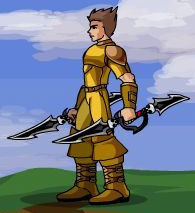 -- Npman5 for special attack info. -- roibup for original TBoD Information. -- internalstrife1239 for image of special attack. -- [MechAngel] for "Mighty" entry. -- Z.324 for Upgraded Doom weapons name fix. -- Brilliancy for the new image. -- ILmaster13 for shop link. -- Stephen Nix for special attack images and corrections. -- hades is my cat. -- SalvationXI for updated location link.